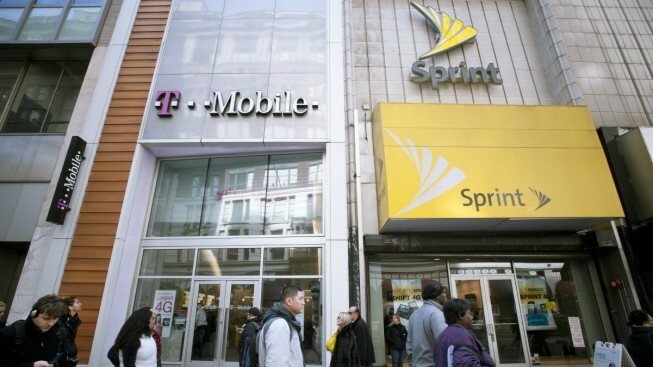 This 2011 file photo shows the T-Mobile and Sprint Nextel cellular phone stores in New York. Sprint and T-Mobile have sealed a blockbuster merger agreement, producing a telecom behemoth that values the combined company at $146 billion, the two carriers announced on Sunday. The proposed all-stock deal values Sprint at about $59 billion and the combined company at $146 billion, including debt, CNBC reported. Without debt, the combined company is valued at $26.5 billion. The new company — which is touting an ability to create a large scale 5G network and thousands of U.S. jobs — will preserve T-Mobile's name, and will have dual headquarters in Bellevue, Wash. and Overland Park, Kan. John Legere, T-Mobile's current CEO, will retain the top job in the newly formed company. If approved, the combined T-Mobile would have an estimated 120 million subscribers, but would be better positioned to compete against the two largest U.S. carriers, Verizon and ATT, both of which have more than 100 million subscribers each.